Science Debate 2008, an effort endorsed by leading scientific organizations, called for a public debate in which the U.S. presidential candidates were asked to share their views on the issues of the environment, health and medicine, and science and technology policy. Each candidate answered questions regarding their respective positions on matters of scientific innovation. Their responses to the top 14 science questions facing America, including positions on scientific integrity, genetics research and stem cells, are presented in an easy-to-read side-by-side comparison at Sciencedebate2008.com. The side-by-side comparison Science Debate 2008: 14 Answers Obama McCain is also free for download as a PDF . What follows is brief synopsis of their answers. Senators Barack Obama and John McCain agree that policy should be based on science. Both candidates criticize the current administration for denying facts and basing government decisions on ideological predispositions instead of scientific evidence. Obama promises to restore the role of the President’s Council on Science and Technology (PCAST) as advisor to the President. McCain pledges to have a science and technology advisor in the White House. Both candidates recognize the ethical, legal and social issues associated with genetics research. Obama supports the Genetic Information Non-Discrimination Act (GINA) and introduced the Genomics and Personalized Medicine Act of 2007, which is aimed at ensuring the safety and accuracy of genetic testing. McCain speaks less of genomics or personalized medicine and more about ensuring the privacy of electronic heath records and the fostering of a “new Green Revolution” in agriculture to improve crop yields. Obama and McCain both support federal funding for stem cell research. McCain also supports funding for other research, including amniotic fluid and adult stem cell research. Obama favors responsible oversight of embryonic stem cell research and an expanded federally supported stem cell research program. With respect to research and development funding, there is a sharp contrast between the two candidates. Obama looks to renew the government’s commitment to investing in biomedical research, which has suffered a major lapse over under the current administration, and pledges to double the basic research budgets of key science agencies such as the National Institutes of Health (NIH), the National Science Foundation (NSF), the Department of Energy’s Office of Science (DOE) and the National Institute of Standards and Technology (NIST) over the next 10 years. McCain plans to freeze all discretionary spending for one year, which would effect the research budgets of all the science agencies listed above, continuing the trend over the last five years of effectively reducing biomedical research funding. Research!America, the nation’s largest non-profit public education and advocacy alliance, is committed to making research to improve health a higher national priority. You can read more about the presidential candidates and medical and health research issues at the Research!America blog. Additional information on what Senators Obama and McCain have said regarding important science policy issues is also presented at Scientists and Engineers for America, a nonprofit, nonpartisan, educational organization. The side-by-side comparison documents quotes from each of the candidates with links to news and media websites. I’ve written previously about Today’s Science, Tomorrow’s Cures. The Federation of American Societies for Experimental Biology (FASEB) voter engagement website, ScienceCures.org, has compiled a “Pre-Election Roundup” of news and web links concerning science and the 2008 elections. The roundup features resources for scientists and the public who want to learn more about the candidates’ positions on science issues, and describes FASEB’s election-related activities, as well as other election-year efforts in the science advocacy community. The page also includes an extensive review of recent local and national news items covering science and the elections. A principle difference between the two presidential candidates is their philosophical difference on healthcare. In the second presidential debate, Senators Barack Obama and John McCain were asked, “Is healthcare in America a privilege, a right or a responsibility?” . Obama believes it is a right while McCain views it instead as a responsibility. The Obama plan emphasizes increased health insurance regulation while the McCain plan stresses deregulation. To reduce costs, the McCain plan also emphasizes deregulation of health benefits and tax reform. In contrast, the Obama plan will establish a national minimum standard of coverage and aspires to control healthcare costs through government interventions. This months edition of The New England Journal of Medicine includes perspectives from the two candidates on healthcare reform. The journal editors asked each of the candidates to describe their plans for reforming the U.S. healthcare system. A side-by-side perspective on Health Care Reform and the Presidential Candidates is free for download as a PDF . Republished below are excerpts from the article. My health care plan has three central tenets. First, all Americans should have access to the benefits of modern medicine. Once and for all, we must ensure that this great country lives up to its ideals and ensures all Americans access to high-quality, affordable health care. Second, we must eliminate the waste that plagues our medical system — layers of bureaucracy that serve no purpose, duplicative tests and procedures that are performed because the right information is not readily available, and doctors providing unnecessary care for fear of being sued. Third, we need a public health infrastructure that works with our medical system to prevent disease and improve health. Under my plan, if patients like the insurance they have, they keep it and nothing changes, except the costs are lowered. For those who are left out or have substandard insurance, my plan will offer a choice of affordable health insurance plans. Through a national health-insurance exchange, people without employment-based insurance or who work in small businesses will have a choice of private insurance policies at rates similar to those offered through large firms. To promote competition among insurers, we will also give patients a new public-plan option, providing the same coverage that is offered to members of Congress and their families. To make insurance affordable, we will give families income-related tax credits to expand access and streamline plan enrollment and transactions to reduce the administrative burden. I will also expand Medicaid and the State Children’s Health Insurance Program immediately to cover all children who don’t have private coverage. And I have specified how I will pay for it — by cutting out waste in the system and redirecting the Bush tax cuts for the wealthiest Americans to help middle-class families afford health insurance. Access and choice: Every American should have access to quality and affordable coverage of their choice, including keeping their current coverage. American families — not government bureaucrats or insurance companies — should choose the coverage that best meets their unique needs. Quality: Strengthening health care quality requires promoting research and development of new treatment models, promoting wellness, investing in technology, and empowering Americans with better information on quality. Affordability: We need genuine competition in the health sector to ensure that drug companies, insurance companies, hospitals, and every other aspect of the health care system are responding to the needs of American families. By rewarding quality, promoting prevention, and delivering health care more effectively and efficiently, we can ensure that all Americans can afford the health care coverage of their choice. Portability and security: We must allow Americans to keep their health insurance as they move from job to job or job to home, and we must protect Americans’ economic security from unforeseen health events by expanding coverage and savings options. While we take steps to lower health care costs, we must also improve access to health insurance. An important part of my plan is to replace the current tax exclusion of the value of health insurance from employees’ taxable compensation with a new refundable tax credit of $2,500 for individuals and $5,000 for families. Families can use the tax credit to continue their employment-based insurance or to find a plan that better meets their needs. A recent report released by the non-partisan healthcare research group The Commonwealth Fund examined key differences in the presidential candidates healthcare proposals . The study estimated that, under the Obama plan, twice as many uninsured Americans will have health insurance in 10 years than under the McCain plan, spending far less per capita for its coverage of the uninsured population. 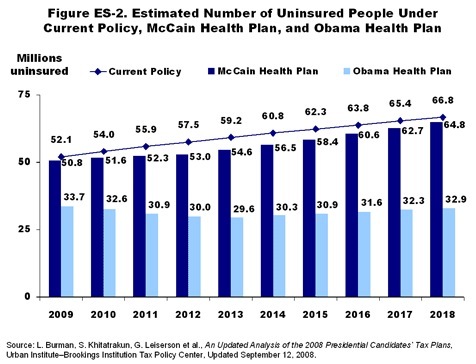 The Urban Institute-Brookings Institution Tax Policy Center estimated that the total federal cost of Obama’s plan could reach $1.6 trillion USD compared to $1.3 trillion USD for McCain’s plan. However, if adequately financed, McCain’s high-risk pool proposal could add an additional $1 trillion to the cost of his plan over 10 years. For more information, the Commonwealth Fund offers an interactive webpage to compare summaries the two health reform proposals. Further resources for comparing the candidates’ positions on healthcare can be found at 2008 Presidential Candidates: Health Care Issues Side-by-Side. In addition, 2008 Your Candidates. Your Health. educates voters on both presidential and congressional candidates. Rational voting decisions require informed citizens. Take the time to learn about the candidates’ positions on biomedical research and healthcare so that you can make an educated choice. The New York Times has a great article discussing the presidential candidates and innovation: Rivals’ Visions Differ on Unleashing Innovation. If you know of other articles discussing the presidential candidates’ positions on science, innovation and healthcare, share it with us below in the comments. 2008 Your Candidates. Your Health. Science Debate 2008: 14 Answers Obama McCain. Science Debate 2008. Accessed 2008 Oct 15. The Second McCain-Obama Presidential Debate. October 7, 2008. Commission on Presidential Debates. Accessed 2008 Oct 15. Health Care Reform and the Presidential Candidates. N Engl J Med. 2008 Oct 8;359(15):1537-1541. Collins et al. The 2008 Presidential Candidates’ Health Reform Proposals: Choices For America. The Commonwealth Fund. 2008 Oct 2.